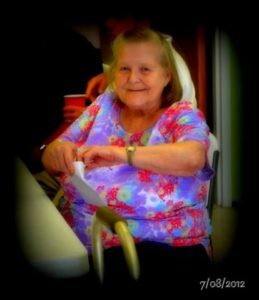 Smithfield – Alice Stephenson Hill, age 81, died Tuesday, February 12, 2019 in Barbour Court Nursing and Rehabilitation Center in Smithfield. Born July 8, 1937 in Johnston County she was a daughter of the late Abraham Lincoln and Mazie Johnson Stephenson. She was preceded in death by her husband, Joseph L. “Bill” Hill; great grandson, Dillon Collidi; and sisters, Martha Jackson and Sue Adams. Alice was a member of Baker’s Chapel Church in Smithfield. A graveside service will be conducted at 2:30 p.m. Friday, February 15, 2019 in Baker’s Chapel Church Cemetery with Rev. Sherman Dilley officiating. The family will receive friends from 1:00 – 2:00 p.m. Friday at Parrish Funeral Home in Selma. Surviving are her son, Dennis Hoyt Hill, Jr. of Smithfield; daughters, Sharon Hill Jones and husband Phil of Marshville, Betsy Hill and significant other Harry Owen of Princeton, and Denise Hill and husband Norman of Princeton; brothers, Billy Stephenson, Ray Stephenson, Donnie Stephenson; sisters, Judy McLamb and Elaine Coone; grandchildren, Greg Jones, Beth Johnson, Dawn Chambers, Michael Owen, Harry Carter, Dennis Wayne Hill, Alison Louise Hill, Nicholas Hill, and Blake Hill; and eleven great grandchildren.